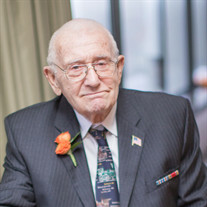 Paul Wesley Day, 90, died on March 27, 2018 at Heart Homes in Linthicum surrounded with the love of his family, friends and fellow residents. Born in Jessup, MD to Charles and Pearl Day, he lived for over 60 years in Glen Burnie. After graduating from Glen Burnie High in 1944, he entered the Navy and served in China. In 1946 he married Sylvia Eveson also of Glen Burnie. At that time, he completed his studies at Maryland Institute of Art in drafting and served an apprenticeship as a machinist. He worked in this trade for over 30 years at the B & O Railroad, Continental Can and Western Electric. He enjoyed traveling. He was also active in many community organizations, including AARP and GBIA. He was a long time member of St. Alban's Episcopal Church. Paul was preceded in death by his wife of 68 years, Sylvia Day. He leaves behind two sons, Charles Day and Martin Day of Glen Burnie and their wives respectively, Michelle Day and Toni Day. He is also survived by three grandchildren, Matthew Day, Justin Day and Jacquie Day all of Glen Burnie as well as his great granddaughter, Emma Day. The family will receive visitors at Singleton Funeral & Cremation Services, P.A., 1 2nd Ave. SW (at Crain Hwy) on Thursday, April 5th from 3-5 & 7-9 pm. A Funeral Service will be held at St. Alban's Episcopal Church on Friday, April 6th at 11AM. Interment will follow at MD Veterans Cemetery, Crownsville. In lieu of flowers, please make contributions to St. Alban's Episcopal Church, 105 1st Avenue, SW, Glen Burnie, MD 21061.